Troubles are inevitable, and they often come without warning, it is how we deal with them that makes the world a better place. Everyone comes with a set of possibilities. My calling was to leave the world a more accessible place. We are all unique in our problems. Every human being is really important, because they bring a different perspective to life. I’ve gone through quite a bit of what can qualify conventionally as hardships. Yet, for me, the way to look at it is that I have got a set of hardships and a set of advantages. The question is: What am I doing with my hardships that can help someone else who suffers from the same? That’s where my foray into accessibility and my passion towards it began. Understanding my own strengths and weaknesses and then using my strengths to overcome my weaknesses is what helped me ride over tough situations in life. 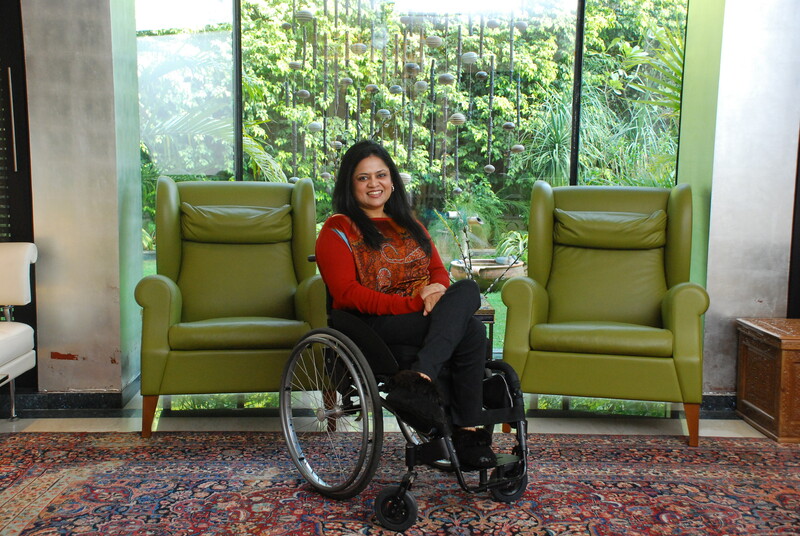 I met with a car accident at 11 that left me confined to a wheelchair. I have had a turbulent family life too. To be able to overcome all these challenges was very difficult, that too at a time when there was no internet. My options were very limited. It was a dark time when I was growing up. I was my parent’s first born. It was a nightmare for them as well. Everyone was busy trying to make me feel that everything was okay. I didn’t socialise much. As an 11-year-old, how many people can you meet? My physical surroundings suddenly became very limited. Before the accident, I loved to dance and suddenly I was in a wheelchair, and was told that I would not be able to move around like before for about two years. They were trying to be kind but for a child to see ahead of themselves for even two years is not easy. Somewhere deep down I believed in God. I believe in the intrinsic power in every human being. So I asked myself, what can you do with this situation you are faced with? What do we mean by accessibility? For me, travelling from one point to another without barriers, without difficulties, is accessibility. It is relevant in today’s fast-changing world—infrastructure, both in terms of buildings and transport, need to be accessible to enable a person to lead a fulfilling and healthy life. Seemingly simple incidents can make one feel so excluded at times. Once a shopkeeper refused to let me enter his shop as I was on my wheelchair. “You cannot enter my shop,” he said and when I asked why, pat came the reply: “Because you will carry dust in with your wheels.” And guess what, it was a shoe shop! Another time I can recall vividly was while flying somewhere I was asked to sign an indemnity bond absolving the airline of all responsibility in case something happens to me. What was ridiculous is that the same is true for any “regular” flyer: Anyone can be taken ill on a flight, I am just more visible. Incidents like that created a revolution inside me. I was never in denial. I wanted to understand the problems as they came and tackled them and led life to a point that I felt that I was not given category A problems despite this wheelchair! People can make the wheelchair their be-all and end-all but I was able to see beyond it. What my parents did differently was not allow me to wallow in self-pity and neither did I dwell on the pity side. I dwelt on making through the day, playing what I could; bullying my little sisters was an outlet too! I learned how to enjoy the small happiness and not chase after the big ones. I think that’s what we fundamentally do wrong. We are so busy looking for that big break to come that we forget to laugh every day. For me it is strange that people don’t laugh loudly for days. Laughter, enjoying life’s little moments and seeing the positives around you as an individual, really helps; comparison never does. Perhaps that is why my mother named me Sminu, the one who keeps smiling. A question I’m often asked is how it feels to be the only woman in a male-dominated industry. My answer every time is the same: I manage humans that pick up steel, I don’t manage steel! What matters is your capability to do so. It is unfortunate that when a woman is assertive, she is perceived as aggressive. Women have taken over in so many different areas. They have proved themselves successful. My message to them is: The world is yours, it is your oyster. Capability matters, not whether you are a man or a woman. The wheelchair was a one-time event that happened to me. I was still young, I could train myself to make my muscles stronger, lead a better, disciplined life to be able to be out there and part of society. But inaccessibility happens to people who are “regular” too. People have a stroke or a heart attack at a young age. People who are not smokers get cancer. What about arthritic knees, how about old age or difficult pregnancies? Life is fraught with so many troubles. We wish they gave a letter before coming, but things happen. Humans can be empathetic. They have been given brains to help one another. We need to make accessibility an integral part of our life; it should not be taken it for granted. We should try to make the world a better place. Include people from all walks of life. It will be better if all of us are included into contributing our best. There’s a reason why god didn’t make all trees to be mango trees. Life should be reflected upon, I’m a compulsive thinker. I like to think about everything in my life, I like to reflect. Certainly there are lows, the strategy is to sit down and do a reality check. What’s the worst you can imagine, and why would it happen? Talk logically and you would see reason. Don’t depend on the outside world to stimulate you. As we grow older, we are counting on ourselves to pick ourselves up. In life you will come across people who like to feel big by making you feel small but you need to be smart enough to understand that it speaks for them and not you. If someone tells you negative emotions, you should be able to see through it. Introspection really helps. If something doesn’t kill you, it only makes you stronger. I have learned to overcome my challenges and I’m sure you will overcome yours. A visionary and thought leader, Ms Sminu Jindal is the first woman in India to break the glass ceiling and lead in the Steel, Oil and Gas Industry as the Managing Director of Jindal SAW Limited. The organization is constantly marching ahead globally under her robust leadership. Alongside her feats in the manufacturing industry, Ms Jindal has championed the cause of ‘Accessibility for All’ through her organization, Svayam. She is the first and the only women to work extensively towards access improvements based on universal design in the public infrastructure and transport systems to make them accessible and friendly to people with reduced mobility, which includes; elderly, children, pregnant women, women with babies, people with physical injuries, and persons with disabilities. Under her leadership and guidance, Svayam was conferred with the National Tourism Award for not just making Qutub Minar, the first UNESCO World Heritage Site accessible for all, but subsequently the Red Fort and Fatehpur Sikri as-well. Apart from numerous honors and recognition for her persistent work and leadership, Ms Jindal was conferred with Young Global Leaders 2009 by World Economic Forum, L’Oreal Femina Women Award 2014 in the ‘Favourite Face of a Cause’ category, and GAATES Award of Recognition 2016.